I have been falling behind on all my Block of the Month blocks, but I am still enjoying them and keeping all the directions up to date so that when I get to the next point I will still know what to do even if I am not on time. I worked on the February part of the Stars for a New Day quilt. This one is a real challenging project. 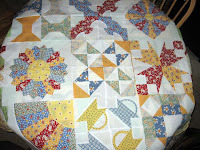 I just added this pieced border tonight and am not sure I am up to the next border. It is made of pinwheel blocks and it is all seeming a little too busy to me, but the techniques are really good practice and the directions are very well written. The Quilt Show has even had a video to go with the directions each month which is extremely helpful. I'm not sure how much further I will go with this because of the time and difficulty. I'll take a little break from it then decide. 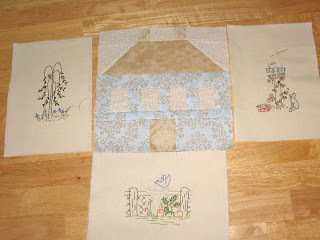 I have also been working on the Verandah Views blocks slowly and am just a little behind on them but I did make a pieced house block the other night for nothing in particular I just have wanted to make one ever since I got the Fig Tree Quilts Houses book. 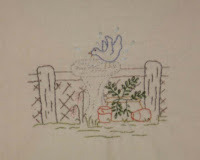 I had my embroidery laying out nearby and noticed that the colors looked so good together that I think I will have to change the layout and add the house block in the mix. Spring has sprung and work is busy. I haven't had much time to work in my garden but, when I went to water the other day I was surprised to find that 3 of the 10 tomatoes I had planted had froze last week. Our weather has been really weird, warm one day and cool the next...today it was about 90. I guess that is normal for us though at this time of year, but still it always surprises me. I had just packed away my winter clothes and got out my shorts then we had a few really cold days when my tomatoes froze and now it is back to shorts. Another on-going quilt project I have been working on is my color blocks. I worked on a yellow one the other day. 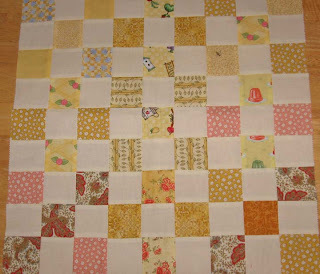 I am using scraps that I have sorted by color then cut into 2 1/2 inch squares and alternate with a cream colored plain cotton. I am looking for an idea to tie it all together with some sort of strips or cornerstones or something. I have several ideas, but keep thinking that it would really be easier to figure out using EQ6...could that justify the purchase? I think that all the extra hours I've been putting in at work help to justify that I deserve it...that's my logic anyway. There are some bloggers out there that have started a support group to encourage each other to finish up some of their unfinished projects from the looks of this post I should be joining their group, but I kind of like to work on whatever inspires me at the moment and figure I will get things finished in good time. The important thing to me is that I sew for enjoyment, I don't want work with a deadline. I get enough of that at work so this is something I do for pleasure, with no pressure. 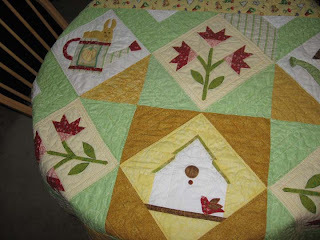 One thing I have enjoyed in blogland this week is to visit Park City Girl's blog...she has done the most remarkable cyber quilt festival. 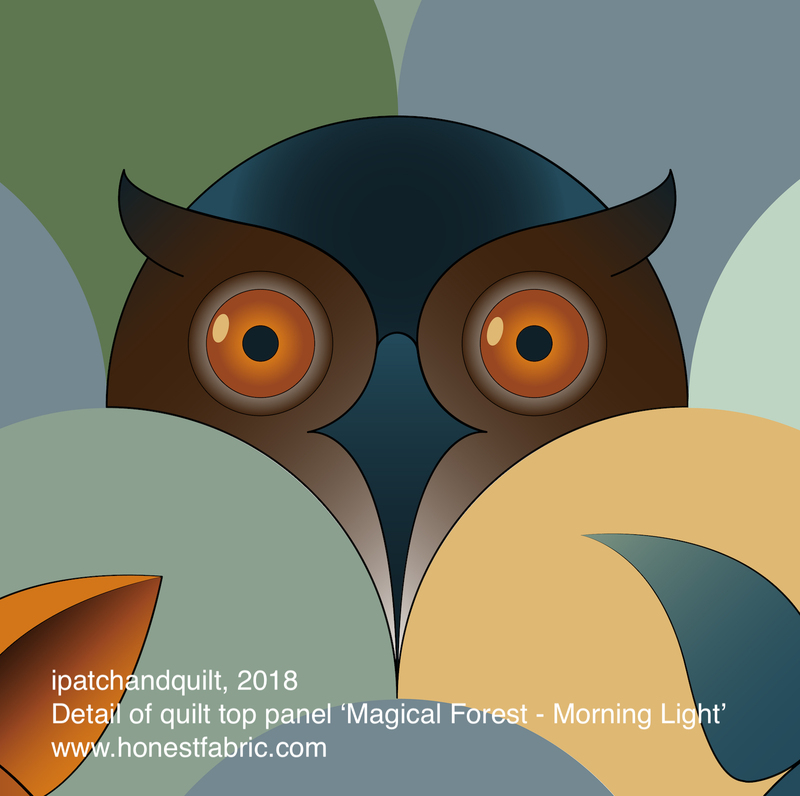 She got 363 bloggers together and they all posted their favorite quilts with a little story about it on their blogs and we can all go visit and see these wonderful quilts. There are as many different styles of quilting as their are people and each project had a special meaning to the quilter that quilted it. It is very fun to go look at especially for someone like me who always seems to be working when there is a quilt show around here. I am so thankful for people like Amy who take the time to put things like this together for so many others to enjoy. It truly is remarkable! I will be thinking Spring and freshing up things around here a bit. 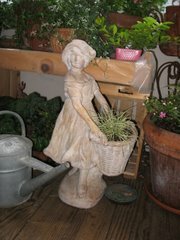 It's time to clean out the cobwebs, get organized, and plant some new flowers and veggies to enjoy in the warm days ahead. This is truly my favorite time of year. I am really not the best blogger, but I do enjoy it. Mostly I read lots of other blogs then run out of time to post on my own. I have finished my Thyme to Water quilt. It took me a whole year to do it, but I did enjoy every minute of it. I designed the quilted border with trowels and flower pots, but they didn't show up in the pictures I took. I really like the way it turned out, so whimsical and simple. 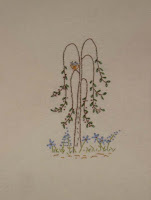 I am also working on Anne Sutton of Bunny Hill's Basket applique blocks, but I haven't fully completed any of them. I am using them to learn to applique and I think it is helping a lot because they are simple enough, but I have tried several different techniques and it kind of looks like it so when I get the hang of it more I will post pictures of what I did. I think I will redo the January block, but the other two will be fine after I add a few finishing touches. 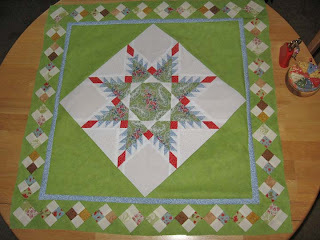 I have been doing this piecing of blocks for almost 2 years now and I am still feeling like I am in a learning mode and wondering when I will feel more confident with what I am doing. Most important is that I am enjoying the time spent painting with fabric and I feel like I am putting together pieces of my life everytime I piece a block. It is a very fulfilling process. I have been able to spend a little time making blocks for the class that I am taking. We are making several blocks that we can put together any way we want later. I am making mine from some bright wash tub prints. In the picture I laid them all out on my table, not sure how I will piece them yet. I am enjoying making each block so much I haven't really given it much thought yet. I was watching a video this morning about EQ6 and using it to design sashing which might be pretty helpful to rewatch. I keep thinking I should get this program (Electric Quilt) not only because it would be fun to play with, but because it would be helpful to visualize what a quilt would look like before I put a lot of time into something that I didn't like. The price is still quite high staying right at $150 so I'm not sure I am ready to invest that much right now. I am working a lot of over time though so it might just help me to justify it in the future. I am hoping to get some more of my other projects complete soon and have more things to post about. We did go on a trip to Goldsmith seeds last weekend and took a lot of pictures of the flowers at the show. I posted about it on my other blog: Growing Thymes. I have a lot more pictures and things to write about on that blog about the trip. There are so many beautiful new varieties of plants in process and it was really exciting to get a sneak peak at their work in progress. The displays were so beautiful too. It gave me a few good ideas. 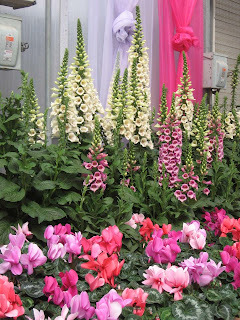 How I wish I could grow some mass plantings of these foxgloves. They really are so impressive!